The ironic thing about small business is that we are often our own worst enemy when it comes to improving cash flow. We do things that really cause us to have different issues when it comes to our cash flow, and sometimes the solution is right in front of us, and we just don’t see it. This has been my mantra forever. So many of us are guilty of this. I know I was when I first started my business, and I know that many many small business owners continue to do the same thing over and over. Now is a great time to adjust your practices so that you’re not a bank to your customers. Here’s a typical scenario from a service provider. Somebody provides service to a customer, and they get their work done at the beginning of the month, and then they wait until the end of the month, and they create an invoice. They send that invoice off to their customer, and the invoice is due in 30 days. So the customer waits and waits and waits and waits until the end of the 30 days, and then they go ahead and pay the invoice. Well that’s all good and well. It’s a really good thing that you’re getting paid because getting paid is what it’s all about, but here’s the problem. Let’s look back at that timeline. From the moment that you did your work to the time that you got paid was 60 days. There’s not a whole lot of businesses that can survive on a 60 day payment. But you might be thinking, well but wait a minute Denise, my payment terms are 30 days. Well yes, that’s true. But, if you did the work at the beginning of the month, and you didn’t invoice until the end of the month, let’s just give it a little bit of time, and maybe that’s 25 days, alright. Then your customer takes 30 days from that point in time to pay. Look at what you’ve done to yourself. You worked all that time and not gotten paid for almost 60 days. So I’m telling you right now, one of the key things that you can do in order to improve your cash flow is invoice as soon as the work is done. There is absolutely no rule that says, hey, you have to wait until the end of the month to invoice. None, whatsoever. That’s a self-imposed rule. We do that to ourselves, and there’s no reason for it. So, that will improve your cash flow if you get those invoices out the door. Think about it this way. If you get your work done at the beginning of the month, say by the seventh of the month, you invoice on the eighth, and then you invoice for 30 day terms, and we’ll talk about your terms in a minute. That’s another issue. Then you’ve cut your response time for payment down by 22 whole days. So you’ve gone from 60 days to 38 days. 38 days is still a pretty long time, but it’s a lot better than 60 days right? Put that into practice, see where you can do that in your business. Hey, that’s how your business survives, is by cash flow. And if you set up an entire situation where you have to invoice for your services, get those invoices out the door. I know I worked with one woman, and she didn’t get payment, she didn’t get payment, she didn’t get payment. Well her problem was, she didn’t invoice in a timely fashion. That’s the main thing that you have to remember. If you’ve set up invoice arrangements for your business, you have to get those invoices out the door. And don’t forget to put your payment terms on the invoice. Because I don’t know about you, but I don’t typically pay bills timely that don’t have a due date, right, do you? So make sure you put a due date on your invoices. There’s a ton more small business cash flow advice in my book. Get it below. 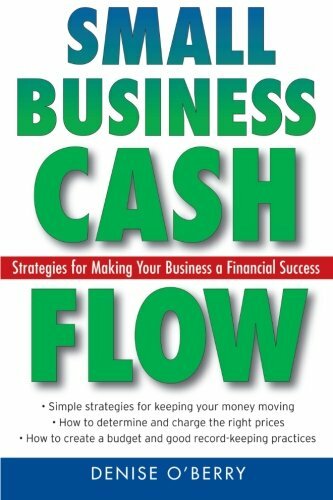 Small Business Cash Flow: Strategies for Making Your Business a Financial Success If your business is struggling, it's probably due to a problem with cash flow. More businesses fail because of cash flow problems than any other issue. Full Disclosure: I earn a commission if you click this link and make a purchase, at no additional cost to you. Everything is always up for negotiation. I get a lot of questions about payment terms from small business owners. Can I negotiate this, or can I negotiate that? Well you know what, it’s your business. You can do anything that you want to do that your customers will tolerate. There is no rule, absolutely no rule, that says you have to have 30 day payment terms. I have no idea who made that up, but everybody just thinks, well if I invoice someone I’ve gotta have 30 day payment terms. That is a bunch of baloney. You do not. You do not have to do that. You can negotiate one day payment terms, five day payment terms, 10 day payment terms, anything that you want. It’s just that you have to take charge of the negotiation with the customer. And I’ve gotten a lot of push back on this from other small business owners. They’ll say, aw but no, my customers won’t go for that. Well, if your customers won’t go for that, and that’s the way you want to run your business, guess what, you need to find different customers. Most of the time, I have not had a problem when I’ve renegotiated terms with my clients. I had one particular client, and initially with this client I was a sub-contractor to a contractor for them. Oh that’s another whole story, you want to try not to go there. Anyway, this company was supposed to pay by the eighth of every single month. So I would issue my invoice to the contractor, the contractor would invoice the client, and then when the contractor got paid, I would get paid. Well, this contractor was one of those that’s not real good about doing invoices. What ended up happening is it took over 30 days for me to get paid, and that’s just not acceptable, it’s not acceptable at all. After a few months, I worked with the client directly, and I said, do you like my work product? I was doing some freelance writing for them. And they did, they were very very happy with it. So I said, I would love to continue with you, but I’m not going to continue as a sub-contractor to this contractor because this person does not pay in a timely fashion. So they agreed to that, and I talked about my payment terms, and my payment terms were net 10. From the time I sent the invoice, then I was to be paid in 10 days. No problem whatsoever. You just have to talk to people. And here’s the key to it, because I’ve even done this with really big companies, and with public agencies when I’ve consulted with them, you just have to get to know the people who are writing the checks. That is one of the things that will really help you. And the key here is remembering it is people. It’s people that’s writing the checks. You’re not doing business with a company, you’re doing business with individuals within a company. And if you get to know those people, treat them like human beings, guess what, they’re gonna treat you like a human being right back. So negotiate the terms of your contracts, even with big companies. Now one of the things you have to keep in mind though, and a lot of people would be wary of this, but have some confidence in yourself, is you have to be willing to walk away from that client agreement if they don’t agree to your terms. I have not had that situation happen to me whenever I’ve negotiated terms. And my terms are short terms. Take a chance with it, it’s worth it. This one just totally blows my mind. I cannot believe that people will continue to work and work and work when their customer isn’t paying them. But I see it all the time, all the time. Pleas on Facebook groups and other online boards from small business owners who say, I’ve been working for this person for six months, and now the first three months were great. There was no problem, I was getting paid, but the last three months, every time I’ve tried to get paid, this person just tells me well they’re kind of in a crunch right now, so they can’t pay me. Ah, the first time they don’t pay you you stop working. You don’t continue working when somebody is not paying you. You’re in business, your business cannot survive without cash flow. So you have to get paid. And you know I’ve heard all the same sob stories, well I feel bad for this person, blah blah blah. Well you know what, who’s going to feel bad for you when you go out of business because you have no cash? That’s what happens when you do work and your clients don’t pay you. Don’t just get promises, get money. Your business can’t survive without cash, it just truly can’t. Hello! I'm Denise, Your Project Partner -- I manage your projects and the project team so you can achieve that dream business you've been chasing. Managing the project plan, the deliverables, the timeline, the to-do list, and the team to get it all done are the things that light up my day. I'd love to help you get your projects done. Click here to learn more. Will Your Business Sizzle or Fizzle This Summer? Get Your FREE Success Strategies Guide Now!